The Open Learning Lab (OLL) reopened this fall with a new layout, computing equipment and furniture. The renovation was supported by a grant from the Student Technology Fee. The design team used universal design principles to improve accessibility and flexibility as well as promote collaboration. 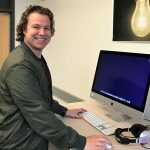 Stop by Commons Hall (UW2-140) to use the big-screen 65-inch Avacor Surface Hub and new workstations set up with headphones, computers with photo, video, and sound editing software, improved ergonomics, and a charging outlet for phone and laptop.